Bitcoin, the libertarian’s dream currency, is far past the heady days of late 2013. When one Bitcoin was worth $1000 USD, there was no end to what could be done; new, gigantic mining rigs were being created, every online store jumped onto the bandwagon, and the price of Bitcoin inevitably crashed. Right now, the exchange rate sits at about $280 USD per coin, valuing all the Bitcoins ever mined somewhere around $4 Billion USD. That’s a lot of coins out there, and a lot of miners constantly verifying the integrity of the greatest thing to come from the Bitcoin community: the blockchain. The bitcoin is just a record, or the ledger, of every transaction that has ever occurred on the Bitcoin network. It’s distributed, and the act of mining coins creates new blocks, or another set of data committed to the blockchain for eternity. While magical Internet money™ is by far the most visible product of the blockchain, developers, investors, and other people in the know are gushing about the possibilities of what can be done with a distributed record that can’t practically be altered and can’t be deleted. [Jon Matonis], a figurehead for the entire cryptocurrency movement, recently said Bitcoin has become the strongest computer in the world, and stronger than all of the top 500 supercomputers combined. All of this computational power is effectively funneled in to verifying the integrity of the blockchain. Bitcoin and other cryptocurrencies are not just a completely anonymous payment system; that’s only a side effect of the blockchain. The blockchain is the only inherently valuable part of a bitcoin; each transaction is logged in the blockchain, providing incredible security over how every coin is spent. No currency in the history of mankind has ever had a record of how every dollar or denarius is spent, and at the very least makes for very interesting economics research. Now, thousands of researchers across the globe are wondering what else the blockchain can do; tapping the power of the most powerful computer on the planet must have some interesting applications, and in the last few months, a few ideas have popped up. The idea of secure, immutable transactions recorded for all time has obvious applications for contracts and any other legally binding agreement. Already, a few companies are on the case: Stampery is basically a blockchain-based notary public, capable of verifying ownership of files, certifying that emails have not been tampered with, and can do so without an in-house database. It’s directly tied to the Bitcoin blockchain. Every bitcoin transaction means a little money changed hands, and in the case of Bitcoin, this makes for a perfect substitute for money transfer services like Western Union. With incredible volatility, Bitcoin is not for everyone, so what if real money could be transferred via the Bitcoin blockchain. That’s the idea of Uphold, and while this basic idea doesn’t have the security of a pure Bitcoin transaction, it is somewhat interesting. While the previous examples are application-specific and mostly tied to certain companies and industries. There is another project, something that started out as ‘Twitter on the blockchain”. Blockcast is an open source effort for simply storing data on the Bitcoin blockchain. In storing data on the blockchain, the data are embedded on up to 16 Bitcoin transactions. It doesn’t allow for storing large amounts of data. The total compressed size of a document is no larger than 1277 bytes, or about the length of this post. By any measure Blockcast is useful in a way similar to Twitter; just something that allows anyone to broadcast information to anyone else. Unlike Twitter, it’s doing so in a cryptographically signed, verifiable format that can never be deleted. All of these ideas are just platforms built on top of the blockchain, and each of these platforms require a slight re-invention of the wheel. That’s where Ethereum comes in; it’s a decentralized platform to build applications that run on the blockchain. Any developer can create an application like distributed crowdfunding, a democratic organization, or literally anything else you can do on the Internet. The distributed and perpetual nature of the blockchain is perhaps the purest example of the cyberpunk philosophies that have wound through the Internet over the years. In the blockchain, you can have a completely leaderless organization that can be vetted by anyone on the Internet. It is the most democratic and perhaps anti-corporate application computers have ever been trained on, and the uses for the blockchain will only grow from here. It can be if you mined the coins yourself (no pool) and spend them via a VPN. There are individuals and organisations logging the IP’s used to submit transactions on the block chain. Did they ever track down the supposed hackers that stole all those bitcoins from Mt. Gox? wasn’t it the CEO, Mark Karpelès that pulled an inside job ? Last i read he was arrested. The only problem was that I believe he was arrested in Japan. This means we will never know what really happened. duh, he lives in japan, and mtgox was a japanese company, why would he be arrested anywhere else ….. The block chain is terrible. Why use the blockchain when you could use an Arduino? How about voting? The block chain sounds like a perfect application to verify votes. By providing a means for detecting voter fraud, people can be provided a voting card as an 18th birthday present from the government. Interesting idea, but as others have said, the blockchain isn’t anonymous. With enough effort you can figure out who cast what vote. Might be a way to sufficiently anonymize it somehow though. Sadly the concept of anonymous voting is a fallacy. I don’t understand how they arrive at the data, but both parties have giant databases of household voting records going back decades sometimes. I get local door-to-door volunteers who know my past voting record (looking to make sure I turn out to the polls this time, even noting once when I missed the previous mid-term election), and I have never indicated how I vote to any organization, but they know. The goal is not to anonymize you. In the current election processes everyone knows if you voted or not they just don’t the content of you vote. The article makes it sound like there’s a single blockchain, but there isn’t: each cryptocurrency has its own. 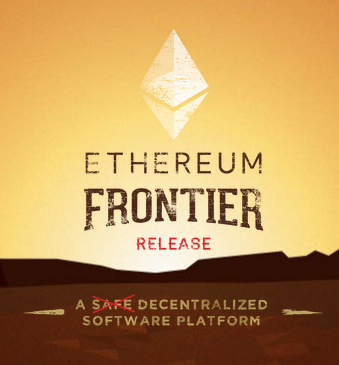 When you say “That’s where Ethereum comes in; it’s a decentralized platform to build applications that run on the blockchain.”, it’s important to point out that the apps run on the _Ethereum_ blockchain, not the Bitcoin blockchain. Thank you! I was confused about that, specifically with Ethereum. Who created the bitcoin? There is a rumour about a mysterious Japenese but I doubt it. My guess is that it was created by some government agency to secretely trade. As one knows intellegence services do things forbidden by the laws of their own countries. Bitcoin is very appropriate to exchange money without leaving traces. “without leaving a trace” you need to learn how accounting ledgers work. So the blockchain grows forever without bound? Even when it’s petabytes long? Granted by then our fancy quantum state drives might be able to handle it, but there’s no provision for trimming or archiving the earliest transactions? I’m not expert on the subject but my understanding is that it is what the name implies. A chain of blocks. You’re balancing the “ledger” in blocks and not all at once every time. The chain can be pruned but it is not implemented afaik. More importantly only full Bitcoin nodes use the full blockchain so storage for most users is a trivial amount. It -is- implemented, but not for wallet-running nodes. Soon bitcoin 0.12 will be released which will enable it for wallets aswell. Gunna b gud! Indeed. Which is a problem. Using currency as a reward for mining makes sense. Who’s going to donate their cpu cycles to validating someones equivalent of twitter? The Blockchain has its uses, and I am hugely for open, federated/p2p based systems, but I don’t see practicality of putting everything on the blockchain myself. Personally I see much more scope for OT (Object Transformation) based systems, allowing decentralized social networks without so much overhead. Theres still the issue of user validation – but I honestly think email based accounts is good enough in 99/100 use-cases. It might not have your name stamped on it like credit cards do, but if theres a decent motivation to track someone down, that record of every transaction would be a gold mine to investigators. Not that I remotely have a problem with that. The potential of abuse of truly untraceable transactions would probably be very high. Hiding a few million from the tax man when needed would probably suit many companies quite well. “Anonymous” here doesn’t mean “identity hidden,” it means “identity not inextricably tied to.” Your identity is tied to your credit cards; it is not tied to cash bills you hold in your pocket. It’s why you can’t prove a $100 bill stolen or not from someone, because the owner of that bill’s identity is not tied to the bill itself. Until bitcoin, all transactions conducted online were conducted through credit card, which uses your identity. So it’s not that using the currency will hide your identity. With regard to investigators — yeah. But most sketchy btc transactions won’t be conducted in lump sums. If someone buys $1,000 of something on a darknet market but pays for it in installments of $254, $391, and $355 (possibly even to three separate wallets) then what’s an investigator looking for? If those btc were bought cash and/or went through a tumbler, forget it. Humans have used untraceable currencies for the last 8000 years. That’s exactly what you’re doing when you pay your plumber in cash so that he doesn’t charge tax, or when a crooked businessman carries a suitcase of $1000 bills across the border to stash it in another country. As far as I can tell, these problems haven’t caused a collapse of the social order. I don’t see why untraceable digital currencies would be any different. I think the more likely problem is that you’ve been conditioned to think it’s necessary to give up your anonymity “for security reasons”. Western governments have been pushing this mumbo jumbo for the last 15 or 20 years, and it’s having the desired effect. What if someone adds something that would normally be taken down by the DMCA? Will this render the whole blockchain illegal? I guess this could be use by some anti cryptocurrency organization to attack the whole thing? That’s hilarious, and I really want to see someone do this just to see what would happen. Meaning that you *could* embed anything you wanted in the block chain from an anonymized IP using coins mined through that IP and nobody could do anything to remove it? It’s simultaneously really disconcerting, and hilarious. Obviously with your example that’s bad, but it’s a weird notion. The blockchain is big enough as it is. We don’t want to download all the episodes of Sesame Street when all we need is transaction history. Since you mention bitcoin, here’s the gameplan: tops out around $300, idk, could go higher because black Friday. $420, 768, who knows. But then, it goes back down so everyone can load up before 2016 moon launch. If you don’t know why 2016 is moon launch, then you don’t know why it went from $12 to $1200 the last time, and you should brush up on the subject. The blockchain is in essence a model for a distributed database system. There are many possible applications for such a system, decentralised social media, web search, and trustless storage/lookup of public keys spring to mind. If I made a coin (because I wouldn’t want to screw up bitcoin) the blockchain would serve as a webserver for Wikipedia or something. Maybe if they did that, they wouldn’t have to ask for donations anymore.